What can I do in NICU? This Sunday is Mother’s Day so I thought I would mark the occasion by sharing the story of my first Mother’s Day. 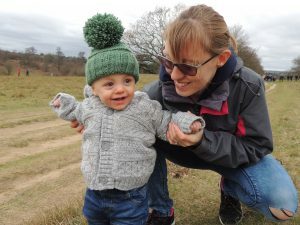 Last year was my first Mother’s Day; it was an extra Mother’s Day that I shouldn’t have had, my babies should still have been tucked up inside me with my husband buying a “from the bump” card, but that’s not what fate had in store. 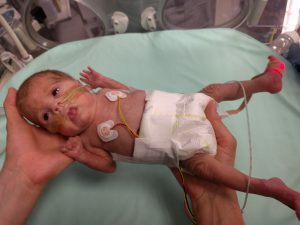 Instead, here was Henry, still in intensive care but thankfully now making good progress, and meanwhile we were on the brink of planning a funeral for his brother. Despite the circumstances being far from ideal, I chose to look at the many positives and despite everything, for me, this was still a time to celebrate. I couldn’t wait to arrive at the hospital to see my beautiful boy who had survived against the odds to be here, and as a result I had gained an extra Mother’s Day, so how could I complain? To make the occasion extra special I was able to do something new for Henry. For the first time I was able to give Henry his first top and tail wash, it may seem insignificant but it was amazing to just hit another milestone of something I could do for my baby. I also had a brief cuddle, very brief as Henry was a bit unsettled so had to go back in his incubator rather quickly, but no matter how brief it was, to me it didn’t matter as at least I got a cuddle which, just a few weeks ago would have been something I could only dream about! 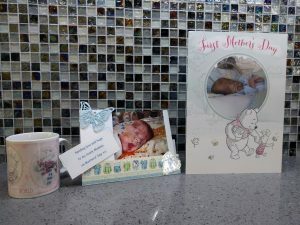 Overall we had a good day, Henry had managed to do a bit of shopping from his incubator, buying me a nice personalised mug and when we arrived on the unit all the nurses had made cards from the babies with their pictures on, which were a beautiful treat for each of us! This year, I am very much looking forward to waking up to my happy, bouncy baby boy at home and just having some nice cuddles in bed, okay if they come with a side of breakfast I’m not going to complain either! When you’ve been on a journey like ours you learn to appreciate the small things so whatever we do on Sunday, I’m going to lap up every minute with my miracle baby. I hope you have a nice time too. Happy Mother’s Day! If you have a NICU Mother’s Day story I’d love to hear it! Tell me about it in the comments below or over on our Facebook page.